By Greg B. Fernandez Jr.
How many of you experienced violent storms at sea? If you haven't none of us here will fully understand the context by which the Apostle Paul went through or what the disciples went through, along with Jesus. Let me take you to a few scenes in the Bible where people experienced violent storms. There are two passages I want us to look at. The crossing of the sea of Galilee by Jesus and his disciples and the the voyage of Paul to Rome with over 276 people. First, we will look at the voyage of Paul to Rome. Turn your Bible in Acts chapter 27. At first I thought of a title Peace in the Midst of Storm, but the topic assigned to me this Sunday is Trusting God in the Midst of the Storm. When I studied the passage, however, I decided to change the title slightly different. The topic I would like to unpacked today is Outlasting The Storms of Life. As storm of life does not last; but we must outlast it. If we don't outlast the storm it can destroy the very foundation where we stand. When the storms of life hit, that's when you will discover the level of your spiritual maturity. You will never know how strong your faith is until you go through a period of trials. What is a storm of life? A storm of life is (1) anything that threatens our safety. (2) Can be a situation that could endanger our lives. (3) Storms of life could be an adversity, it could be a natural disaster, a tragedy or a terminal illness, etc. In this world, we will go through storms of life. how we react in the storm is important. In the passage that we read, we saw how Paul responded in the storm. What made Paul so hopeful and peaceful a midst the raging waters at sea? When all hope for survival is gone, what kept Paul so peaceful and hopeful? There are two voices here? Which one is right? Who has the best discernment of the situation? Sometimes disaster or problem can be avoided if we practice the power of discernment. In this story, if only the centurion had obeyed Paul's discernment of the situation, they could have avoided the storms. Many young people today are in so much trouble because they had not listened to the advice of their parents. Many people today faces consequences of their own choices simply because they had not God's command. God has given us the ability to think for ourselves and find solutions to our problems. How did Paul use discernment? (1) Before they hit the storm, Paul knew the problem it's dangerous to continue the voyage (v10). All of these tell us that faith in God does not negate personal responsibility. In the storms of life, doing your personal responsibility is necessary. Do what's needed to be done and don't sit waiting for the waves to drown you to death. When we are face to face with insurmountable problems, trusting God's promises is not easy. Often, instead of trusting the His promises, we spend time worrying about our problems. We'd rather trust our own ability and common sense to solve our problems than to spend the battle on our knees.While it is important that we find solution to our problems, it is indispensable that we trust God's Word for us. Here is an example of how to trust God's promise in the storms of life. Paul believed and trusted the Word of God spoken him completely. He believed God will fulfill His promise. His faith is focused on what God told him. Let us read the story of how Jesus calmed the sea. In Mark chapter 4, we find the story of experienced fishermen fighting for their survival in the midst of the Sea of Galilee. After Jesus taught the people all day, Jesus said to His disciples, "Let's go across to the the other side" (Mark 4: 38). The sea of Galilee is 21 km in length and 13 km width. This means that to get to the other side of the lake, they must cross 13 kilometers of water. If you are in the middle of the lake, do you think you can swim at least 6 kilometers? It does not matter what obstacles or difficulties are on the way. When Jesus said, let's go to the other side, he spoke the word of truth and promise. Jesus wasn't planning on drowning in the sea but to get to the other side safely. When the disciples are about to drown, they failed to trust the words of Jesus because of the challenge of the moment. Many times our circumstances can overwhelm us greatly that we failed to believe the promises of God for us. It's natural and normal to be afraid but don't stay in fear nor live in fear. What you are afraid off controls your life. That's why if people can make you fearful, they can control and manipulate you. Fear has the power to paralyze us. Fear stops our progress. Fear blocks opportunities. Fear destroys us. Fear has the potential to destroy our future if not overcome. Here is a statement that can make us secure in every circumstances of life: Don't fear the storms of life because you will not die until your mission on earth is done. If God has missions for you to accomplish, He will make it sure you are safe until they are fulfilled. Let's read verse 23-24 again. Paul Said, "For this very night there stood before me an angel of God to whom I belong and worship, and said "Do not be afraid, Paul; you must stand before Caesar. And behold God has granted you all those who sail with you." God is saying, Paul, you cannot die here because your mission is not over. Acts 23: 11 says this, "The following night, the Lord stood near Paul in said, "Take courage! As you have testified about me in Jerusalem, so you must also testify in Rome". When Paul and others are in the middle of nowhere and all hope for survival is gone, God appeared to Paul and reassured him that he will fulfill His promise. Sometimes, when the storms of life hit us, we may lose our possession but if we still have breath and us, there is hope. Fear is in opposition to faith. Every time the disciples face with threatening situation Jesus comforts them and said don't be afraid! Do you remember the story where Jesus walked on water and so did Peter? Every time the disciples were afraid Jesus rebukes them for their lack of faith. Every time the disciples failed to do things, Jesus rebukes them for not having enough faith. It seems that we couldn't accomplish great things without faith! Only faith in God had kept Paul hopeful in the midst of the storms. Paul eventually died in Rome, but not in the storms. He died after his mission is done. According to tradition, Paul was beheaded. How we die is not really important to God, but how we fulfill your missions is. Paul had encouraged the people constantly. "I urge you to take heart for there will be no loss of life among you but only of the ship." (v 22) Read again in verse 33-36. Paul encouraged them to eat some food because they will not die and they were all encouraged. We are not alone in this journey of life. In the storms of life, we need to offer hope and encouragement to others. The storms of life had caused other to be discouraged and gave up the faith altogether. Unless we offer hope to people, they will all drift away and be lost in the raging seas of trials. Look around you, there are people even in this room who need encouragement. One of the best weapons Satan uses against Christians is discouragement. It is important that when our fellow believers are in the midst of a storm, we must come alongside and encourage them. Back to the scene in the Sea of Galilee with Jesus and His disciple. Because of Jesus presence, the disciples were secured in the midst of the storm. Remember this: your safety is secured only where Jesus is. Your security is found in no one else save Jesus Christ. 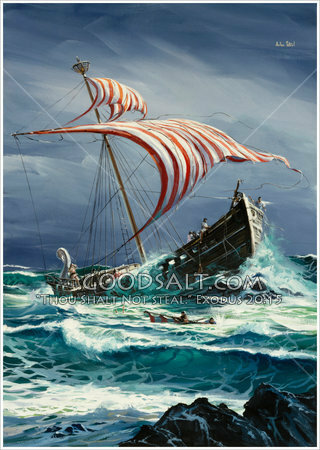 If Jesus is in the boat you can absolutely relax in the midst of the storms of life. Are you facing doubts and worry? Jesus is in the boat. Do you have financial needs? Jesus is in the boat. If you are in a storm today, think about this: your situation is not your conclusion. Your circumstance today does not determine your tomorrows. Today let us allow Jesus to rebuke our storms of life. I challenge you to let Him calm your raging seas. By His power we can outlast our storms! God, we thank you for the storms we are facing. Because we are with you, we are safe a midst our raging seas. Today I speak faith to your problems. I rebuke the financial storms you are facing, be calm in the name of Jesus.